Ordinary People at first who brought Extraordinary Stories. Two Books to read further to see the Persons behind the Stories they tell us, Stories of Experiences that shaped their Lives and later probably ours (without us knowing it). Most of the Time, The Persons look like Everyone, and Everyone has a Story. Sometimes these Stories may seem Simple and Unremarkable, but if we look and listen Closely, we discover Tales of Love and Strength, Hope and Courage, Perseverance and Grace. 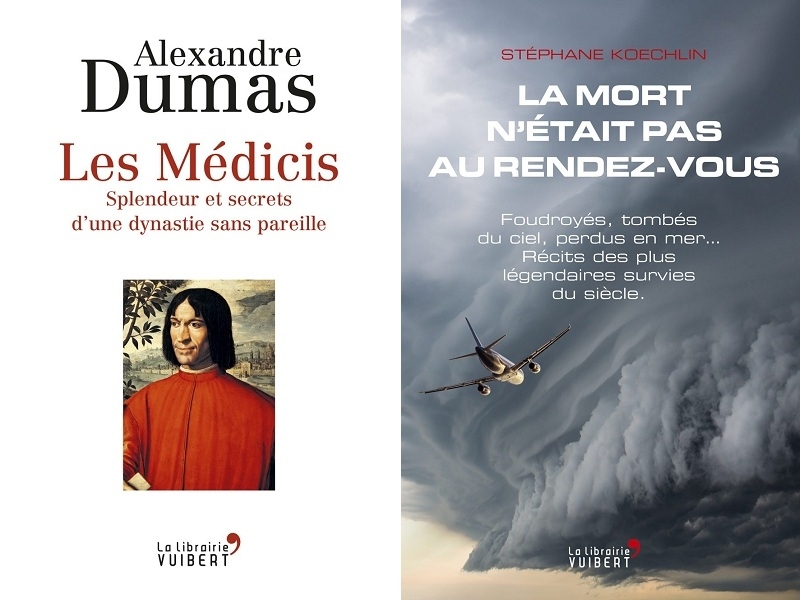 - "LES MEDICIS - Splendeur Et Secrets d' Une Dynastie Sans Pareille" (The House of Medicis - Splendor And Secrets Of An Unparalleled Dynasty) By Alexandre DUMAs and Published in FRANCE by La Librairie Vuibert Editions. 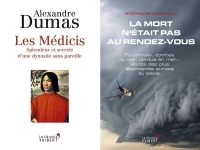 Alexandre DUMAS (Father, 1802 – 1870), was a French Writer, Best Known for the Numerous Historical Novels of High Adventure which have made him One of the Most Widely Read French Authors in the World. Many of his Novels, including "The Count of Monte Cristo", "The Three Musketeers", and "The Vicomte de Bragelonne" (The Man in the Iron Mask) were serialized in Popular Journals, and remain Popular with Audiences of All Ages today. Their enduring Popularity is based on Dumas' Treatment of Universal Human Themes of Unity, Trust and Betrayal, Revenge and Redemption. He also wrote Plays, Magazine Articles, and was a Prolific Correspondent. The House of Medici was an Italian Banking Family and Political Dynasty that First began to gather Prominence under Cosimo de Medici in the Republic of Florence during the First Half of the 15th Century. The Family prospered Gradually until it was able to fund the Medici Bank. This Bank was the Largest in Europe during the 15th Century, and it facilitated the Medicis' Rise to Political Power in Florence. The Medici produced Four Popes of the Catholic Church—Pope Leo X (1513–1521), Pope Clement VII (1523–1534), Pope Pius IV (1559–1565) and Pope Leo XI (1605)—and Two Queens Regent of France—Catherine de Medici (1547–1559) and Marie de Medici (1600–1610). In 1532, the Family acquired the Hereditary Title Duke of Florence. In 1569, the Duchy was elevated to the Grand Duchy of Tuscany after Territorial Expansion. The Medicis ruled the Grand Duchy from its Inception until 1737, with the Death of Gian Gastone de Medici. The Medicis' Wealth and Influence was initially derived from the Textile Trade guided by the Wool Guild of Florence, the Arte della Lana. Like Other Families ruling in Italian Signorie, the Medicis dominated their City's Government, were able to bring Florence under their Family's Power, and created an Environment in which Art and Humanism flourished.... Alexandre Dumas, with all his Famous Talent, Tells us the Extraordinary History of One of The Most Fascinating Dynasty the Western Work even known... The Greatest Accomplishments of the Medici were in the Sponsorship of Art and Architecture, mainly early and High Renaissance Art and Architecture. The Medici were Responsible for a High Proportion of the Major Florentine Works of Art created during their Period of Rule. - "LA MORT N'ETAIT PAS AU RENDEZ-VOUS" (DEATH WAS NOT COMING AS EXPECTED) By Stephane KOECHLIN and Published in FRANCE By La Librairie Vuibert Editions. The Author is Journalist and Writer. He gives Us some of the Most Extrordinary Stories on Normal Peole who made History their Way. Starting by the Real History of Averell Dalton, Historically depicted as the Oldest, but most Stupid one of the Daltons. The Daltons (Today, mostly in France) are Fictional Outlaws who regularly appear in the Lucky Luke Comic Book Series and Arch-Enemies to Lucky Luke. They were created by Artist Morris and Writer René Goscinny. They are Loosely Inspired by the Real-life Dalton Gang, and billed as their Cousins. While the Original Dalton Brothers are depicted as Evil and Successful these Daltons are depicted as Less Skillful and more Prone to Fighting between the Siblings. Follow the "Tales Of Cyparis", about a young Black Man surviving an Hearthquake and becoming an "Attraction" exploited in a Circus. Violet Constance Jessop “Miss Unsinkable” was an Irish Argentine Ocean Liner Stewardess and Nurse who is known for surviving the Disastrous Sinkings of both the RMS Titanic and her Sister Ship, the HMHS Britannic, in 1912 and 1916, respectively. In addition, she had been on Board the RMS Olympic, the Eldest of the Three Sister Ships, when it collided with a British Warship in 1911. Osamu Dazai was a Japanese Author who is considered One of the Foremost Fiction Writers of 20th-Century Japan. A Number of his most Popular Works, such as "The Setting Sun" and "No Longer Human" are considered Modern-Day Classics in Japan. With a Semi-Autobiographical Style and Transparency into his Personal Life, Osamu Dazai’s Stories have intrigued the Minds of many Readers. Flight Lieutenant Richard Hope Hillary was an Anglo-Australian Royal Air Force Fighter Pilot during the Second World War. He wrote the Book "The Last Enemy" about his Experiences during the Battle of Britain.